The competition, for which participant recruitment started back in November, brought together 25 young talents from seven music schools and two university-level conservatories. The clarinetists, who competed in either the senior or junior age group categories, each performed two musical pieces. 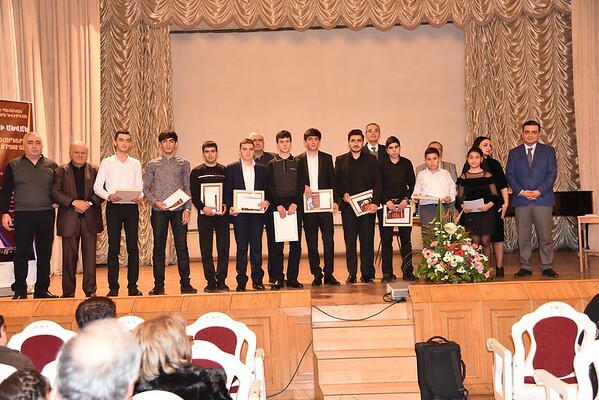 Eleven young clarinetists received prizes during the award ceremony and concert held December 21st at the Armenian State Philharmonic Hall. First prize went to Albert Tovmasyan, 17, from the junior group, and Avetiq Ghazaryan, 29, from the senior group. Mariam Martirosyan from the junior group, and the sole female participant, won the competition’s “Special Prize.” And FAR Gulamerian Scholarship Program alumnus Serob Asatryan, 23, from the senior group, won third prize. Arkadiy Avanesov, Yerevan State Conservatory Vice Rector of International Affairs, congratulated the organizers, participants and winners of the contest and thanked FAR for its cooperation and support. On behalf of the conservatory, he presented FAR with a certificate of appreciation. FAR Education Programs Director Eduard Karapetyan emphasized the importance of the contest in the framework of FAR and its long-term cooperation with the conservatory and its cultural programs. This was the second time FAR supported the competition of talented clarinetists. The first Republican Contest was held back in 2013.